One of the biggest driving mistakes people make is how they drive on winding roads. They drive too fast for the road and/or for their driving abilities. They believe they can go into the curves at a faster rate only to get scared and brake when they are actually in the curve. Braking reduces the amount of control the driver has on the car and ensures a better chance of going out of control and into the on coming lanes. 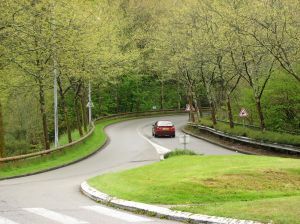 The best way to drive through a winding road is to brake before the curve, then engage the engine lightly through the curve and add to your speed leaving the curve. As long as the engine is engaging the wheels you have more control. Another place where people get into trouble is if their car starts skidding. Many people panic and often they let go of the wheel to cover their faces. Letting go of the wheel is the worst thing you can do. If you are in a skid, you need to swallow your fear and concentrate on controlling the car. In order to regain control of your vehicle, you need to steer into the skid. This means if the back end of your car is sliding towards your left, you need to turn your wheels in that direction, doing this will help regain control of your vehicle. Learn how your car reacts to things. The more confident control you have over your vehicle, the safer you will be on the road and the more likely you will be to avoid a possible accident due to someone else’s driving error. This will help you keep your insurance premiums low and classify you as a low risk driver allowing you discounts and other perks.